This is my arrangement for the Books in Bloom event at the Newburyport Public Library tomorrow evening. A fundraiser for the Friends of the Library and the Newburyport Horticultural Society, it pairs flower arrangements with books. I first heard about it at a Horticultural Society meeting and immediately knew that I would base my arrangement on The Gift by Lewis Hyde and that it would include seed pods and the words of the medieval mystic Meister Eckhart that were quoted in the book. Lewis Hyde describes art in the creation stage as a gift in two ways—the natural talents of the artist and the gift of inspiration. He sees a third stage, when the art leaves its maker's hands. The art that matters to us—which moves the heart, or revives the soul, or delights the senses, or offers courage for living, however we choose to describe the experience—that work is received by us as a gift received. Our generosity may leave us empty, but our emptiness then pulls gently at the whole until the thing in motion returns to replenish us. Social nature abhors a vacuum. 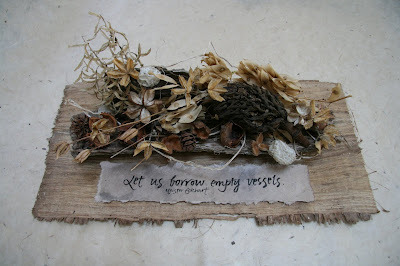 Counsels Meister Eckhart, the mystic: "Let us borrow empty vessels." It is hard to summarize everything in this book. For a casual reader, there may be pages to skip. A wide range of subjects, including usury in the Middle Ages, is presented. However, I believe what Lewis Hyde says to say about the gift has great value not just to artists but to the creative impulse that is within us all. He is such an eloquent writer that it seems best to let him speak for himself. ...we are sojourners with our gifts, not their owners; even our creations—especially our creations—do not belong to us. As Gary Snyder says, "You get a good poem and you don't know where it came from. 'Did I say that?' And so all you feel is: you feel humility and you feel gratitude." The arrangement of pods, both local—horse chestnut, rose of sharon, sweet gum, hosta, wild cucumber, dawn redwood, beech—and from my travels—southern magnolia from South Carolina and cotton from Texas, rests on a piece of bark which rests on a piece of papyrus. The quote was written with a Pentel brush pen on Lokta paper from Nepal.